1) Front view. I won't go into a lot of details yet, but it will be chain driven X/Y-wise and a lead screw for the Z-axis. 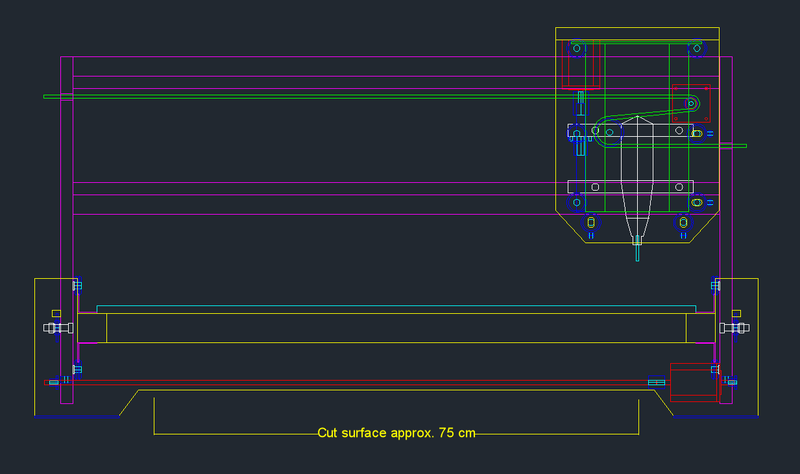 I hope to reduce the carriage width by around 5-10 cm in the final version. 2) Side view. Hopefully I've gotten most of the weight centered to avoid wobbling. The expected cut length is around 117.5 cm, which is slightly larger than a regular pinball playfield. Larger pieces can be cut with a little manual repositioning of the carriage and resetting of the zero-position in software, but I do believe this should be sufficient to start with. Not too impressive, but I'd rather have it as good as possible before actually making it. 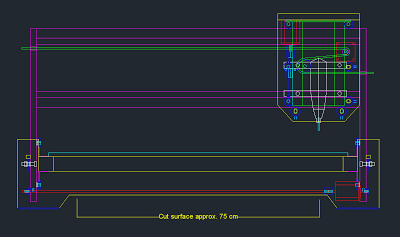 Note that the rails for this design is based on 30mm width/height, but hopefully I'll find L-profiles of a smaller size so the overall design will be slimmer and the cut area slightly larger.